OTTAWA, ON – A group of 12 breweries in Ottawa and surrounding regions have announced details of a multi-brewery advent calendar featuring 24 mystery beers. 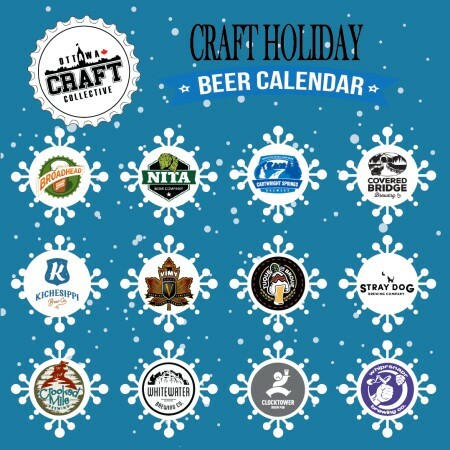 Ottawa’s Craft Holiday Beer Calendar has been organized by Nita Beer Co., and features two beers from them as well as Whitewater Brewing, Brasserie Tuque de Broue Brewery, Kichesippi Beer, Covered Bridge Brewing, Crooked Mile Brewing, Vimy Brewing, Cartwright Springs Brewery, Broadhead Brewing, Stray Dog Brewing, Whiprsnapr Brewing, and Clocktower Brew Pub. As with a traditional advent calendar, each 473 ml can of beer is marked with a number from 1 to 24, and is intended to be consumed on that date in December, leading up to Christmas on the 25th. In order to compile and sell the mixed case, Nita has applied for and received a Manufacturer’s Representative License from the Alcohol and Gaming Commission of Ontario. This licence allows Nita to store and distribute beer from other breweries, but does not allow for in-person sales at its brewery retail store. Instead, the Calendar must be ordered in advance and will be delivered to customers via Canada Post, with sales limited to Ontario residents. For more details and to place an order the Craft Holiday Beer Calendar, see the information and ordering page on the Nita Beer Co. website. Orders will be accepted until November 10th, with delivery to follow later in the month.